The Amazon Christmas ad running lately features smiling, otherwise faceless boxes travelling from a robo-warehouse to a little girl. It’s a fine ad that no doubt brought prosperous smiles to some ad agency. And that about sums up what Christmas has become, eversomuchmoreso, every year. There was a time when the dominant imagery was about singing carols, trimming trees, decorating cookies, and gathering friends and families. Now, one may have to seek to find those icons in the media, on the streets, or even in your own home. President Trump has made a thing lately of announcing that the “War on Christmas” is over, with his minions (elves?) oh-so happy to cheer him on and foist new, post-MAGA signage confirming same. Yet this only seems to re-declare the ongoing war on Christmas. But there is good news: The upcoming new tax code will bring much, much more profit to Amazon and Companies. Most people’s childhoods are like life itself: A complex quilt of sensual recollections, for better and for worse. The holidays rank right up there. But with any luck, there were dark evenings with twinkling lights, hungry afternoons making home-baked cookies, and silent nights of singing traditional songs. Grandma made it so. Having been out running errands today, Christmas shopping looks alive, if unwell. The stores are mostly chaotic, Big-Box voids. The underpaid workers look and act like the walking dead. The merchandise is strewn about like the bulls just left the building. And many stores don’t even seem to bother decorating. Cue back to that commercial. 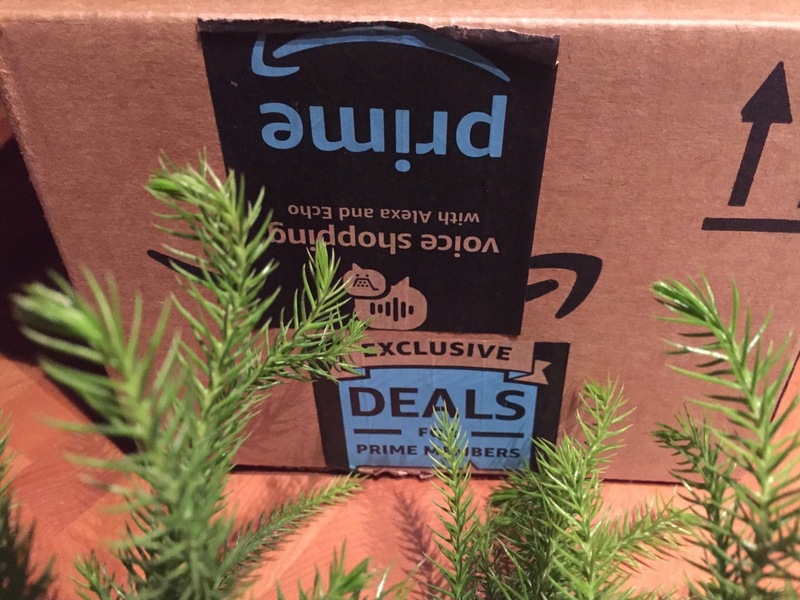 Indeed, the most familiar holiday sound this X-mas may be the r-r-r-r-rip of opening Amazon boxes. Who packed it? Did anyone wrap it? Who was so thoughtful to go click click click, or did you just order it yourself? There is one difference, though: I’ve never seen a real box smile. Nor anyone opening one that came via a faceless delivery service. Still, still, still, Merry Christmas. Happy Holidays. Hug your living relatives. And pray for peace on earth. Amen.